The largest collection of Valentine’s Vintage Dresses are here at Dallas Vintage Shop. This Valentine’s Vintage Inspired Dress is perfect for Valentine’s Dances, Valentine’s Sweetheart Banquets and Valentine’s Formal Events. Bring out the inner Ginger Rogers in you as you don this Sleek, Baby Pink, Satin Full Length Gown. We have Valentine’s Vintage Dress, Pink Formal Valentine’s Gowns, Valentine’s Formal Attire and Valentine’s Themed Full Length Dresses in stock. Valentine’s Vintage Dresses, like this one is just one of many Formal and Semi-formal Valentine’s Day Fashion Dresses we offer. 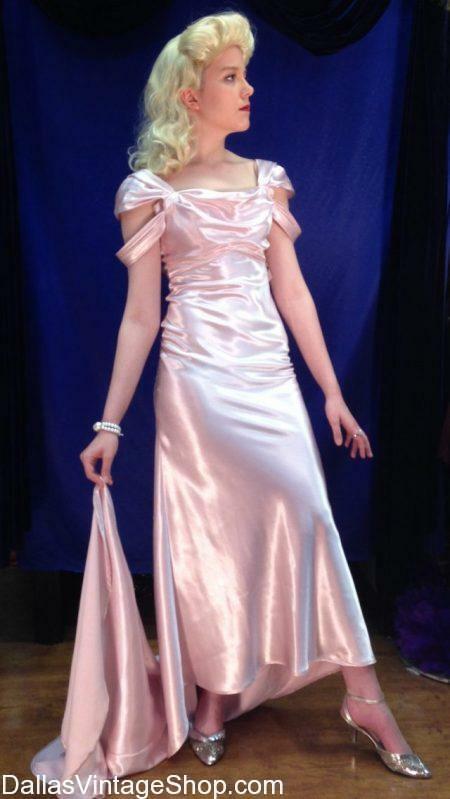 This Sleek Satin Baby Pink Ginger Rogers Style Valentine’s Day Dance Dress is only one example of the many Vintage Style Dresses we keep in stock for Valentine’s Events and other Special Occasions. We have a Huge Collection Valentine’s Vintage Dresses and all the accessories that are perfect for each and every Valentine’s Formals and Semi-Formal you can imagine. There is no limit to the Dresses, Semi-formals and Formals we stock for Valentine’s Prom, Sweetheart Banquets, Classic Hollywood Stars Parties and Gala Valentine’s Gown Events.